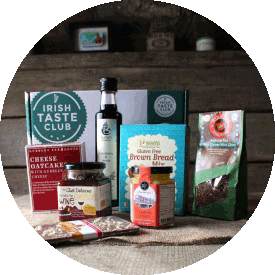 Each month we carefully select between six and eight products from award-winning Irish artisan producers from across the island of Ireland, box them and deliver them to your home or workplace, no matter where you live. For you to share & enjoy! A monthly Irish farmers’ market! We’re delighted to welcome Ballyshiel Chocolate to our Irish Taste Club box this month for the first time. As self-confessed chocolate lovers (who isn’t? ), when we tasted the macaroon bars from Ballyshiel at last year’s National Ploughing Championships we were over the moon, and fell in love with them straight away. If you know of a better macaroon bar, please tell us as we want to know! You can find out more about the Ballyshiel range on www.ballyshiel.com, and we will certainly be using their products again in the future. We have featured the Galway Food Co. Before, and will certainly be back again; owner Claire Colohan and her team are producing biscuits of four different flavours that are now a firm favourite with our customers. As a young girl Claire was always interested in cooking, and baking especially, and had an ambition to put the tastes of Galway into a food. She chose no less than a biscuit, and ended up with a business she’s grown herself from an idea right through to the end product. As the years went on she now has a range of four, and some of you will already have tried her Galway Bay Lavender and Connemara Seaweed-infused biscuits. This month we have sent you the Irish Classic Butter Shortbread biscuits, and we do hope you enjoy them. Well we have had jam with champagne in it, but when we saw a strawberry and chocolate flavoured jam we just had to have it. Sure why not, there’s chocolate in it! 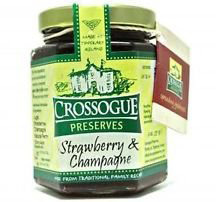 We’ve previously included Crossogue’s mustard in our boxes – Crossogue Preserves are based in Thurles in County Tipperary, and produce a wide range of hand-produced jams, jellies, marmalades, curds, chutneys and relishes, which are full of distinctive flavours. 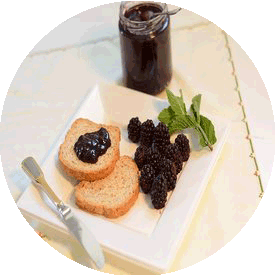 Still using traditional cooking methods with no artificial colourings, flavourings or preservatives, Crossogue Preserves are simply “homely”. Well what can we say – we have to keep going back to the Foods of Athenry because of their simply amazing range (plus the fact that they’re from not only our county, but the same town!). From humble beginnings cooking in the homestead kitchen, the Foods of Athenry has grown into a very strong business with an ever-growing range including vegan, gluten-free and dairy-free products, all of which are very-much in demand. 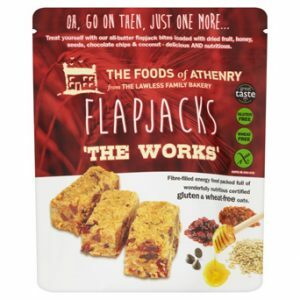 This month we’ve included a product that one of our customers has liked so much that they had their local Irish store stock it, where they now buy it all the time – The Works Flapjacks are pure oat butter-baked flapjacks infused with chocolate chips, sunflower seeds, cranberries, sultanas and coconut. To see the full range, check out www.foodsofathenry.ie. 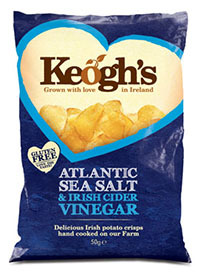 It’s been a few months since we sent out a pack of Keogh’s Farm Crisps, which are always a big hit in the Irish Taste Club box because of their fabulous taste. This month we have selected their salt & vinegar potato chips, but not just any salt & vinegar – all of the ingredients have been carefully selected. As ever, the potatoes are grown by the Keogh family in North County Dublin, where they’ve been doing so for 200 years, so they know best, for sure! The salt is from one of our own suppliers, the Atlantic Sea Salt Company, and the vinegar comes from Llewellyn’s Orchard in Lusk in County Dublin, another great artisan producer. The Keoghs keep coming up with great new flavours, and to keep up-to-date with them you can log onto www.keoghs.ie. Founded by brothers Seamus and Kevin Sheridan in Galway back in 1995, alongside the city’s weekly market, Sheridan’s Cheesemongers have now grown to supply four shops and a number of store counters in retail centres and airports. 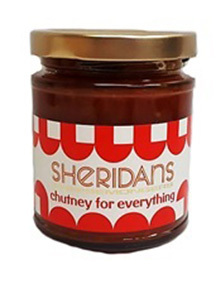 Sheridan’s range is now much more than just cheeses, and this month we have included one of their chutneys, which is called Chutney for Everything – in this, the Sheridans bring together some fabulous ingredients from great producers including cider vinegar from Con Traas’ apple farm in Tipperary, Irish brambly apples and Galway Bay carrageen moss. This chutney is fab, and certainly lives up to its name – you can eat it with everything, so why not post a picture on our Facebook page of what you are eating it with? 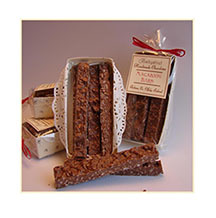 For more on their ever-growing range, and the location of Sheridan food counters, log onto www.sheridanscheesemongers.com.